The design for the Majik Café stems from Karim’s philosophy of creating an inspiring and seamless world that excites all the senses by fusing the physical with the virtual. As always, his design is flashy, soft and refreshing. Karim’s love of sensuous lines and brilliant hues comes through in the dynamic space of Majik and is visible in the walls covered in huge digital prints, the gold vinyl ceiling, the patterned floor finished in engineered stone and the glass bar that changes colour and mood throughout the customer’s stay. 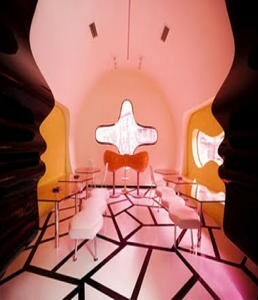 Rounded forms and curves shape the windows and the bar, as well as decorating the walls. The façade is finished in polished, stainless steel tiles. As Karim says, “Spaces should give us an emotional lift, be it fulgent, fervid or peaceful,” a credo that makes his design fit brilliantly into a city like Belgrade, which is rich in contrast and contradictions.